I borrowed this book from the library, and as soon as I started I was hooked! 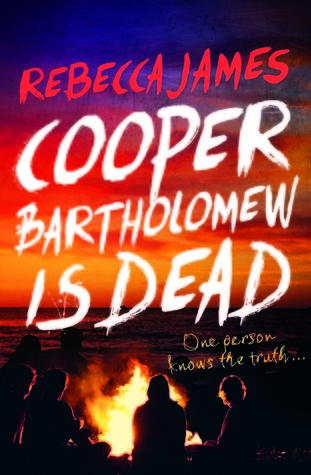 When Cooper Bartholomew is found dead at the bottom of a cliff, it affects a lot of people. They say he committed suicide, but Cooper's girlfriend--Libby--can't accept it. Her boyfriend was happy, he had big plans for the future, and they were very much in love with each other. So she starts asking questions, and soon realises that there's a lot more going on. A web of lies and secrets, spanning several decades, slowly starts to surface. I loved the writing style. It's told in the POV of four characters: Cooper, Libby, Sebastian, and Claire. Cooper is the popular, nice guy who died. Libby is his girlfriend, a nice studious girl in Uni. Sebastian is his best friend and has many secrets of his own. Claire is his bitchy ex who just can't let go. I know it sounds weird to mention them in the present tense, but this story goes from Then to Now and back again. So we actually get to meet Cooper before he died, which I thought was quite clever. The central mystery keeps you reading, collecting all the clues until everything starts to slide into place. It's also very sad to watch Libby's heartbreak, and how the death of one person can shatter so many lives. And it's a great study of just how complicated friendship can become. I have to admit that I actually solved part of the mystery before the end. The most twisted part. LOL. But not the whole thing. Can't say more than that because I don't want to spoil it for anyone. I will say that I really enjoyed this great story. I look forward to reading more books written by this author.